Titwangsa range, also known as the main range contains some of the highest mountains in Peninsula Malaysia stretching over 350km long. The popular tourist area of Cameroon highland is also part of the main range. The main range is also one of the wettest regions of in Peninsula Malaysia. Its mountains, many of which are more than 1500m high causes water-laden clouds from the Straits of Malacca to deposit its load on the mountains. Thus for anyone who are interested in trekking in the main range, he has to be prepared for wet weather. Titiwangsa traverse is a popular trek that crosses three of the four highest mountains in Peninsula Malaysia, Gunung Korbu, the second highest at 2183m, Gunung Yong Belar, the third highest at 2181m and Gunung Gayong, the fourth highest at 2173m. 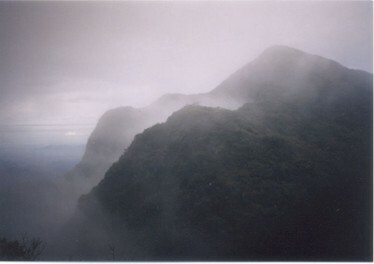 Gunung Tahan, standing at 2187m is the highest mountain in Peninsula Malaysia, but it is not located in the main range. Due to the high rainfall in the main range, the vegetation found on these mountains are thicker and different from those of Gunung Tahan although Gunung Korbu is only four meters lower than Gunung Tahan. The expedition usually starts from Cameroon Highland and ends in a small settlement near Ipoh. The trek would consist involves traveling on old logging trails and some river crossings especially on the last day of the trek. Certain part of the trek can be quite challenging as it requires passing through primary forest and nearer to the summit, there are many fallen trees and tangles of branches that forces you to bend down to pass through them. As the trek involves three mountains, it means that it is necessary to make long descents before ascending the next mountain. 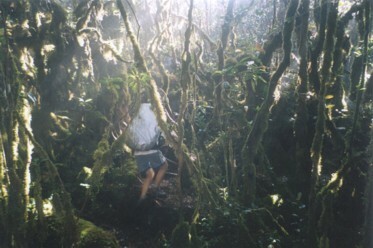 At higher altitude, tangles of moss covered branches and tree trunks makes life difficult (Dec 2000). There are many other challenges posed by the trek. Other then the expected rain in the afternoon, water source can be a problem. For most people who had been to this trek, the first day of trek to Gunung Yong Belar summit is usually a very long one. By the time the summit is reached, it is usually dark. As the campsite is at the summit, water has to be brought from the last water source which is about one and a half hour before the summit. To make matters worse, the route to the water source is not well defined and it is a 10min steep descend from the trail. At night, the temperature can fall to about 10 degrees. The next day would be a descent to a campsite beside a river. However, the campsite is infested with sandflies. It is necessary to bring mosquito coil to keep the number of sandfly bites down. The following day trek to the summit of Gunung Gayong is more difficult. The last water point before the summit is an hour’s trek away. However, to reach the water source, one has to make a very steep descent down the side of the ridge through primary forest and loose soil for about 20mins. The return journey usually takes about an hour. From the campsite at the top of Gunung Gayong, the town of Ipoh can be seen below. 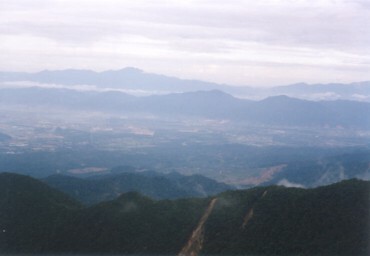 Ipoh town can be seen from the summit of Gunung Gayong (Dec 2000). Day 4 of the trek is perhaps the easiest day so far. The total time taken to descent and ascent to Gunung Korbu summit just over 2hrs. When I was there, there is a total white out and nothing can be seen from the summit of Gunung Korbu. From the summit, it is a straight descent to a sandfly infested campsite beside a river. The last day of the trip is a relatively easy trek with little ups and downs. However, there are many river crossings to be made although the water level is not very high. The rest of the route to the ending point is also infested with tiger leech. These leeches can reach the length of your fingers. On the whole, Titiwangsa Traverse is difficult trek comparable to that of Gunung Tahan trek. The scenery from the summit of these three mountains is usually limited by thick vegetation on them. But, it is still possible to see the distant mountain from certain locations. Frequent rain in the afternoon also made the trek rather miserable at times. I would only recommend this trek for people who had trek in other mountains in Peninsula Malaysia and would want something more challenging. A good fitness level is also highly recommended.